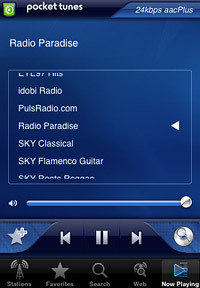 While there are countless internet radio applications available for the iPhone and iPod touch, Pocket Tunes Radio is unique in that it offers satellite radio streaming and a diverse selection of other content. Developed by NormSoft, Pocket Tunes Radio for iPhone is available from the App Store for $9.99. Although it’s a bit pricey compared to many other apps in this category, the cost is warranted if the distinctive features it offers appeal to you. The biggest reason to plunk down the cash for Pocket Tunes Radio is if you’re a satellite radio subscriber. Sirius and/or XM customers have a choice when it comes to listening to satellite radio content on the iPhone – the official Sirius XM app or Pocket Tunes Radio. I’ve used both somewhat extensively and have found that, while the Sirius XM app is very polished and well done, Pocket Tunes Radio still holds a few advantages. For example, subscribers who are still able to access free online streaming will not be able to use the application from Sirius XM. Although their app is free, it requires a $2.99/month premium streaming package. Pocket Tunes Radio, on the other hand, is compatible with both free and premium satellite radio streaming accounts. The other reason some may choose to go with Pocket Tunes Radio is if certain content such as Howard Stern, NASCAR, NFL, MLB, etc. is needed. Popular channels such as these are not available on the Sirius XM iPhone app. Using my XM premium online subscription, I found Pocket Tunes Radio to be a solid product. Signing in to my account was easy, as was browsing channels and listening to exclusive satellite radio content such as Opie & Anthony. The sound quality was decent, but I expected far less buffering interruptions considering the low bit rates. In fact, buffering was a somewhat common occurrence whether I was on WiFi, 3G, or EDGE. When it did maintain a steady connection, though, it was a pleasure to use. Outside of the satellite radio world, Pocket Tunes Radio boasts a few other key features. For starters, radio stations from AOL, Yahoo, and other sources are present in a variety of genres. The amount of choice users have is unbelievable, which means you’ll be hard-pressed to not find something you enjoy. I particularly like the idea of building a web browser right into the application. Since multitasking is not yet possible on the iPhone and iPod touch, you’re stuck in the Pocket Tunes Radio app as long as you want to keep listening. By putting a web browser in the app itself, it’s easy to stay productive by checking emails, news, etc. at the same time. The ability to search for stations and flag your favorite channels add to the overall package as well. 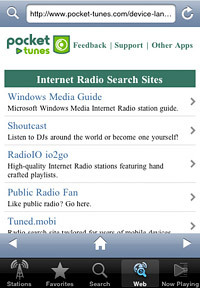 Overall, Pocket Tunes Radio is a quality application for the iPhone and iPod touch. Available from the App Store for $9.99, it’s worth the one-time investment for music maniacs and satellite radio subscribers who aren’t satisfied with Sirius XM’s own app. Although it’s not as unified and seamless as Sirius XM Premium Online for iPhone, its wider range of content and compatibility with free streaming accounts make it a great choice for many users. Take a look at NormSoft’s website for more information about some of the features not covered in this review.